If you’re left wondering what to do with these changes, read on. What is Partner Category Targeting? Partner Categories are simply targeting groups that Facebook had previously made available based on partnerships with third-party data providers. This type of data sharing is common practice in digital advertising realms, but following various challenges (i.e. 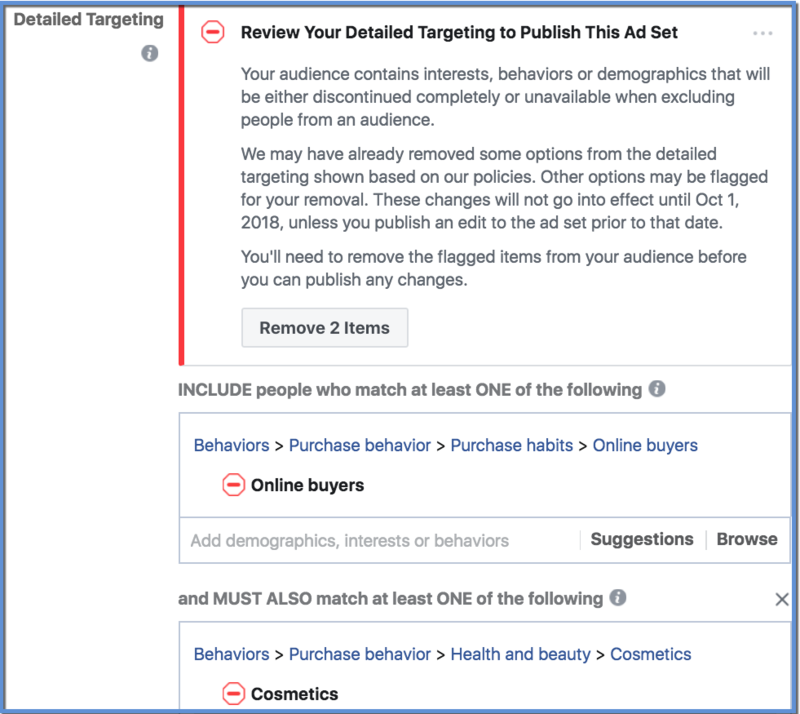 Cambridge Analytica news stories), Facebook has removed these targeting options. 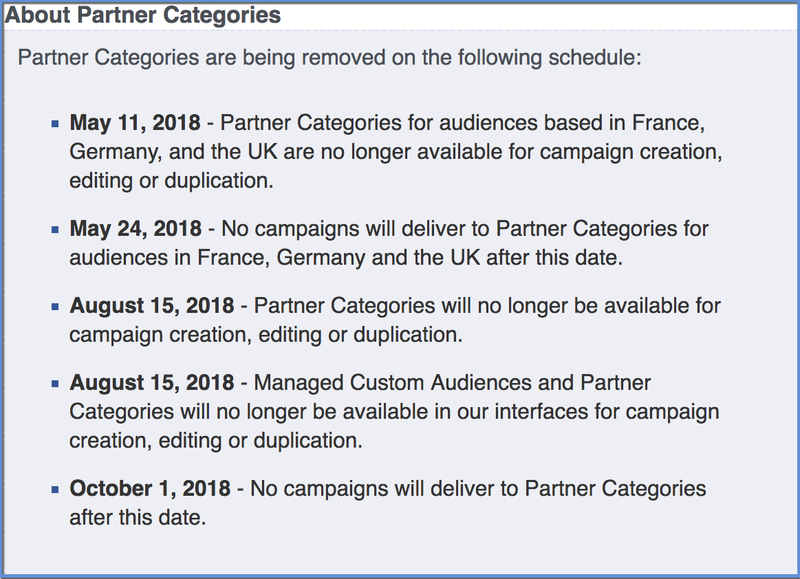 As noted in Facebook’s recent email to advertisers, after October 1st these campaigns may be “paused or modified.” The “paused” component of this language is what could cause some advertisers to experience a mild panic. There are a number of factors contributing to advertiser confusion. Facebook’s email does not make clear whether campaigns with partner category targeting will simply be paused, or if targeting changes will be made automatically. It appears the link in Facebook’s warning email does not lead advertisers directly to their campaigns which may be an issue. Instead, this link simply opens Ads Manager, which leaves some doubt about what to do next. It also seems that advertisers may have received the email even in cases where they have an unused, paused ad set. This often happens with ad sets created with a daily budget, which advertisers may have paused long in the past and never used again. To add to the challenge, it seems there are no warning or error messages that are appearing in the Ads Manager overview. To make your ad review easier, I suggest you only look at Active, Scheduled, and In Review ad sets. Previously completed or unused ad sets should not have any issue, unless you plan to activate them again in the future (in which case, you should review those setups as well!). 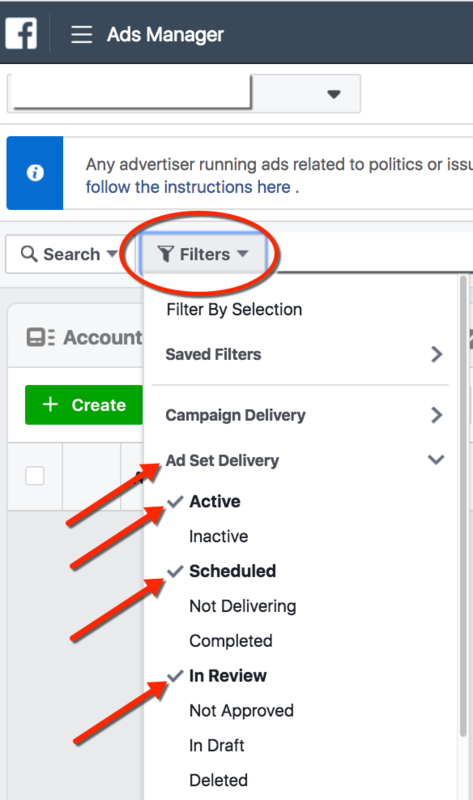 Now you’ve used a filter to populate only the campaigns, ad sets, and ads that meet the applied conditions. 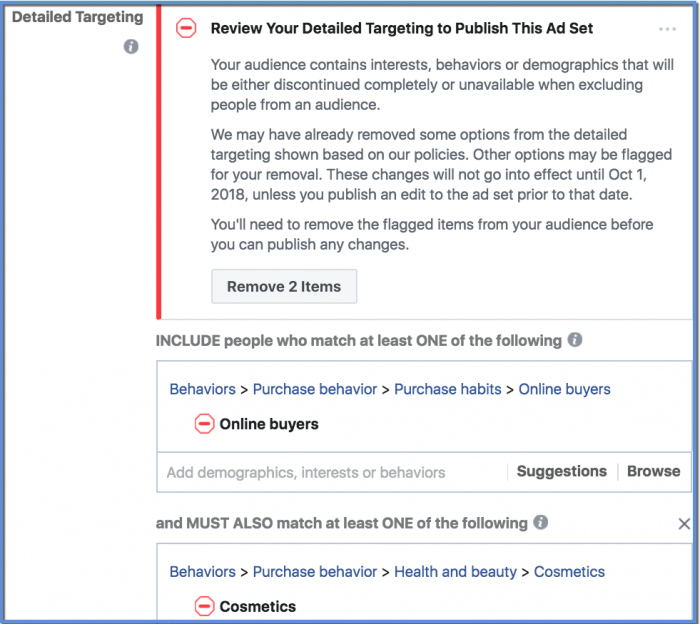 You can review your ad sets and individually inspect the targeting set up for each of these. *The Lifetime date range will reflect the dates in your ad account’s lifetime range, so it will appear different than in my example. 2) Select the ad set you want to review by checking the box to the left of your ad set name. Once you select Edit, you can scroll down to the Detailed Targeting section to review the targeting in place. You can remove problematic targets individually, or simply click the removal button in the warning message to make changes automatically. Once you have changed the target options, you can click to Review and Publish changes from the main Ads Manager screen. Partner category targeting as an “easy-add” option is no longer available. However, some advertisers have reported to have negotiated agreements directly with some of these same data providers. It seems that there may be potential options to establish independently with providers (such as Axciom). That said, we’ve heard from some members of our Power Hitters Club that this process can be somewhat slow. Facebook is a constantly changing platform. Advertisers need to continuously learn and adapt to keep up. If you’re looking for ways to remain competitive in an environment that now has over 6 million advertisers (and counting), you should check out an upcoming training from Andrew Foxwell and Jon: “Q4 FTW”. How are you responding in the wake of the removal of Partner Category targeting? How might these changes affect your strategies?